The British had joined the Dutch in South Africa in 1795. There was a battle for for dominance which resulted in the Afrikaner (Boer) defeat in 1806. In 1807, the British banned slave ownership. n 1828 they took a bold step. By Ordinance 50 the Cape government abolished the Dutch-made Hottentot Codes and declared that all free citizens (including Blacks) were equal in the eyes of the law. In 1834 they banned the sale of slaves. This caused bitter tension between the Afrikaners and the English. 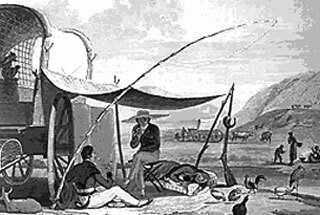 In 1835, the Afrikaners responded to reports of fertile land across the Orange and Vaal Rivers and began a trek northward. Over the next 10 years about 14,000 whites with their servants traveled in groups of several hundred on horseback and in wagons. Many died in confrontations with the Tsonga and Ndebele who resisted the white incursion into their lands, but eventually settlements sprang up in the new lands. The Afrikaners called this area the Transvaal. This region was to become a new battleground for dominance because it contained some of the largest gold deposits in the world. They established two republics, the Orange Free State in 1852 and the South African Republic (Transvaal) in 1854.